A pleasant walk through parkland and fields to the shrine of St Jude in Faversham. St Jude, one of the Apostles and the Patron Saint of Lost Causes, is still widely popular. There are many legends about him, including that he was the bridegroom at the marriage feast at Cana and that he brought Christianity to Armenia – the first country to become officially Christian. Jude is often pictured with the Mandylion (a picture of the face of Christ associated with the Shroud of Turin). This relic was venerated in Edessa, Constantinople and the St Chapelle in Paris before disappearing during the French Revolution. Faversham was an important stop on the Pilgrim’s Way via Watling Street and the burial place of King Stephen. The area of the old Abbey is just down Abbey Street from the market place. The church of St Mary of Charity includes a tomb which may contain the bones of the late King, originally interred at the Abbey. Faversham is also the centre of the Kent hop trade and home to Britain’s Oldest Brewer, Shepherd Neame. From Palace Farm walk 10 yards to the T Junction and take the footpath opposite, veering to the right down to the car park for the church of The Beheading of John the Baptist. The church is straight on across the lane and well worth a visit. On the left near the altar are a number of 13th century images. The graveyard is maintained to encourage wildlife. On leaving the churchyard by the main entrance turn left and follow the lane for 25 yards then pass through into the Doddington Place Estate. The path heads diagonally off to the left across the field and is indistinct at first, becoming clearer after 50 yards on the other side of the driveway. Continue on to the woods where a clear straight path takes you to Sharsted Court. Now turn right and keep to the right down the lane to the road. Here turn left into Newnham. The church of Saints Peter and Paul is on the right. On the left after 50 yards is the George Inn. Carry on past the George to the edge of the village where there is a footpath heading up into the woods on the right. Take this straight ahead for two thirds of a mile until reaching a footpath which heads off at 90 degrees to the left across a field to the corner of North Eastling Road. Go straight ahead to the next corner where you leave the road and continue straight on again. After 200 yards you pass through a gate where you turn right and head up to a track which you follow to the left down past the end of a copse to another gate. Just before the gate the footpath is on the right, somewhat overgrown at the entrance but distinct thereafter. Walk up out of the field and then carry straight on along the next field edge until you come to a sharp left hand turn which takes you through orchards to Elverland farm. Here there is a slight detour around a piece of ground after which look for the path heading straight ahead to Elverland lane. Pass directly across and follow the edge of the field to a lane (a stick for beating back the vegetation may be needed here). Cross the lane and carry straight on for 50 yards before turning right and following the path across the fields to the lane at Painter’s farm which heads into Painter’s Forstal. The Alma pub does a good lunch. From the lane where you entered the village, turn left down the road and over the M2 to a T Junction. Pass straight across, taking the path which heads to the right and then through a field before turning sharply right down to the church of Saint’s Peter and Paul. There is a range of B&B and small hotel accommodation in town. Faversham is a major transport hub with regular fast trains to London and various parts of East Kent. 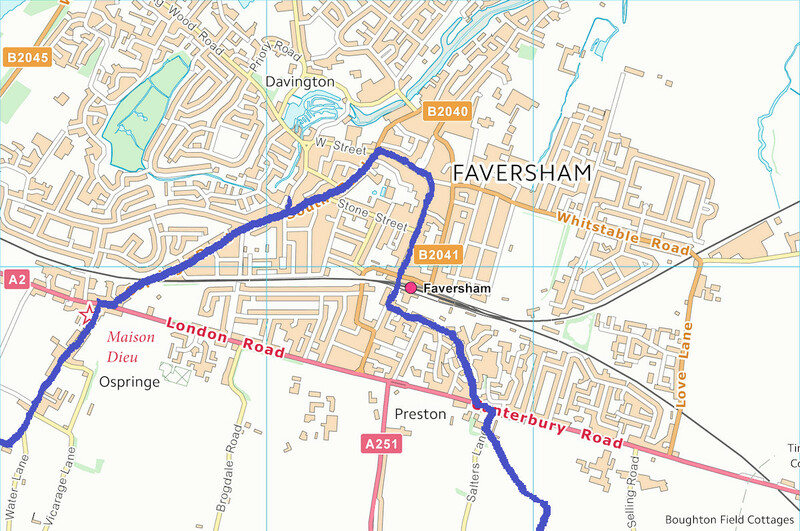 The 344/345 bus route connects Faversham with Doddington. 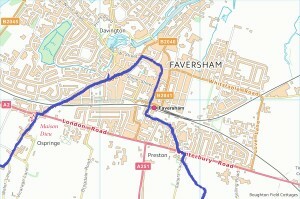 There is a full range of shops in Faversham and any number of good pubs and places to eat.